Shaki, H., Vasheghani-Farahani, E., Shojaosadati, S., Ganji, F. (2014). Optimizing Formulation Variables of KCl Loaded Waxy Microspheres. Iranian Journal of Pharmaceutical Sciences, 10(1), 37-54. Hossein Shaki; Ebrahim Vasheghani-Farahani; Seyed Abas Shojaosadati; Fariba Ganji. "Optimizing Formulation Variables of KCl Loaded Waxy Microspheres". 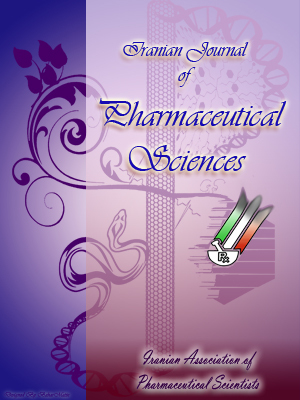 Iranian Journal of Pharmaceutical Sciences, 10, 1, 2014, 37-54. Shaki, H., Vasheghani-Farahani, E., Shojaosadati, S., Ganji, F. (2014). 'Optimizing Formulation Variables of KCl Loaded Waxy Microspheres', Iranian Journal of Pharmaceutical Sciences, 10(1), pp. 37-54. Shaki, H., Vasheghani-Farahani, E., Shojaosadati, S., Ganji, F. Optimizing Formulation Variables of KCl Loaded Waxy Microspheres. Iranian Journal of Pharmaceutical Sciences, 2014; 10(1): 37-54. Potassium chloride (KCl) is a highly water soluble substance which is usually used to prevent hypokalemia. Oil in water disperse phase encapsulation method was used to prepare KCl loaded microcapsules using beeswax and carnauba wax as a hydrophobic matrix. The morphology and characteristics of KCl loaded microspheres were studied using scanning electron microscopy (SEM), photon correlation spectroscopy (PCS) and differential scanning calorimetery (DSC). The particle size distribution of resulting microspheres was narrow and DSC diagrams showed no interaction between waxes and drug. The effective variables were determined using Plackett-Burman design followed by Response Surface methodology for optimization of these variables. Based on this analysis, the most effective parameters on drug loading were found to be beeswax/carnauba wax ratio, drug/wax ratio and rate of emulsification. Using the response surface method, the optimum values of effective parameters were found to be beeswax/carnauba wax ratio =6.245, drug/wax ratio = 0.668 and rate of emulsification = 679.8 rpm.